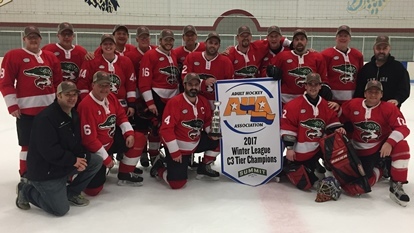 The top teams from the regular season will advance to the 2018-2019 Winter Playoffs. The tournament will be held Sunday, April 7 through Sunday, April 14. The following criteria will be used to determine seeding for the playoffs. There will be no overtime in round-robin pool play. Pool play games will end in ties and will count in the standings. If at any time the score differential is 6 or greater in the 3rd period, the clock will convert to running time. If at any time the score goes below 6 goals, the clock will revert back to stop time. Following a scoreless five-minute overtime, three players from each team participate in the order the Captain selects. The Home team will elect whether to shoot first or second. Each team takes three shots in alternating fashion. The team with the most goals after those six (or less) shots is the winner. If the score remains tied, the shootout will proceed to a "sudden death" format. No skater may partipate more than once until all other skaters have participated.